Berlin's famous Tempelhof Airport closed to the public in October of 2008. 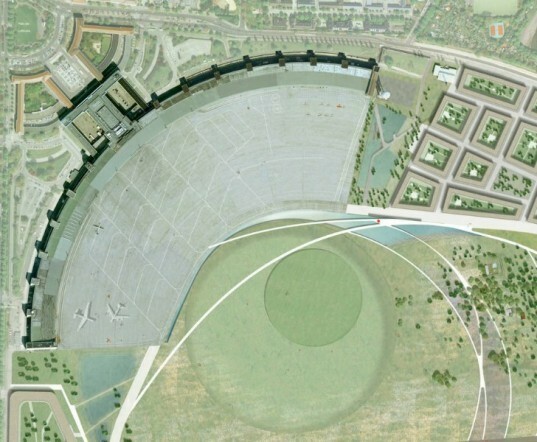 Rather than tearing down the striking semi-circular terminal building, which Norman Foster had once described as "the mother of all airports", the airport, tarmac and runways will be turned into a grand urban garden. Scottish firms Sutherland Hussey and GROSS. MAX. 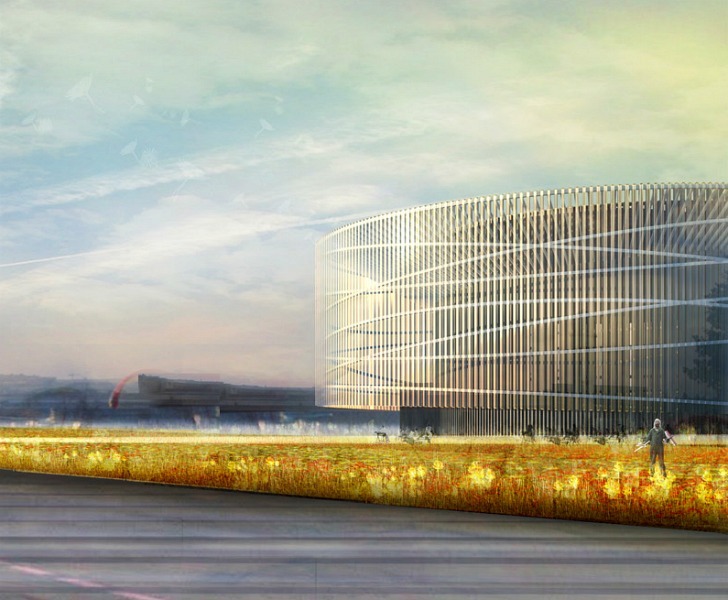 recently won an international competition to transform the efficient transportation center into one of the largest urban garden developments in Europe. The Tempelhof Airport was originally constructed in 1927, but it was reconstructed in 1934 under Albert Speer’s plan for the reconstruction of Berlin during the Nazi era. The limestone-clad 1.2 kilometer-long quadrant was a symbol of Hitler’s world capital — it’s located just minutes from the city center and connects via the U6 U-Bahn line. During World War II, the airport was used to assemble Stuka Dive Bombers and Focke Wulf FW 190 Fighter Planes. Although many fought to keep the airport from being shut down, it has not sat completely idle — it’s often used for fairs and other large events and is officially a public park. Now the famous airport will become even grander with a new scheme to turn the 400 hectare area into a massive urban garden. With an expected cost of around €61.5 million, the new urban park will be one of the largest such projects in Europe. GROSS. MAX. and Sutherland Hussey Architects will design a new park and associated buildings on the site while retaining the famous terminal building. The project is expected to be completed in 2017 in time for the opening of the International Garden Festival. The top floor, about 8th or 9th window from the left. That was my room when I was stationed there from 1976 to 1979. Tempelhof Renovation-Sutherland Hussey & GROSS. MAX. The Tempelhof Airport was originally constructed in 1927, but it was reconstructed in 1934 under Albert Speer's plan for the reconstruction of Berlin during the Nazi era. The limestone-clad 1.2 kilometer-long quadrant was a symbol of Hitler's world capital -- it's located just minutes from the city center and connects via the U6 U-Bahn line. During World War II, the airport was used to assemble Stuka Dive Bombers and Focke Wulf FW 190 Fighter Planes. Although many fought to keep the airport from being shut down, it has not sat completely idle -- it's often used for fairs and other large events and is officially a public park. Now the famous airport will become even grander with a new scheme to turn the 400 hectare area into a massive urban garden. With an expected cost of around €61.5 million, the new urban park will be one of the largest such projects in Europe. GROSS. MAX. and Sutherland Hussey Architects will design a new park and associated buildings on the site while retaining the famous terminal building. The project is expected to be completed in 2017 in time for the opening of the International Garden Festival. A large rock monument will stand somewhere in the middle. A pavilion will sit near the runways.